The Town promised a report on creating a broadband utility months ago, but it hasn’t been mentioned recently. Local broadband could provide much faster connections, with better service, at a lower cost, and create a new income stream and local jobs in the process. I’m not a cell phone user, so I don’t care, but reports continue to come in of spotty cell phone service in the area, including some key downtown locations. I may be wrong, but I hear rumor that tech folks like to use cell phones. 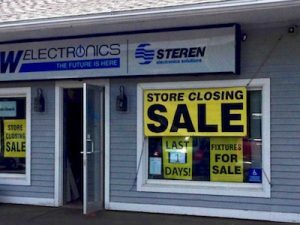 With the closing of BRW/Radio Shack, Brattleboro has lost its only real source for electronics parts. Hardware stores have a few items, but we no longer have a place to, say, pick up parts to make or repair electronic gizmos. Brattleboro has excellent 2-D printing, but 3-D printing options are very limited. The ability to print 3-D objects easily would be a useful community service, even though most people probably don’t realize it yet. I know people who wouldn’t be caught dead in a Walmart but use Amazon. I know people who say they support local, but get their printing done at VistaPrint. There are people who will gladly write all day, unpaid, for the Facebook corporation, but won’t send a letter to the editor of a local paper. We do have coffee shops and place for people to meet. We do have some internet and some cell phone service. Schools are beginning to work Maker projects into what they offer. Most of all, we have the talent. We have everything we need here to do everything we need to do here. We have coders, designers, copywriters, artists, animators, videographers, manufacturers, accountants, bankers, and so forth. If we changed our attitudes just a little bit, we could protect these local resources and build upon them. Brattleboro should make a push for municipal broadband. BDCC should work to attract an electronics parts store. Makers should be as active and visible as NEYT or NECCA. SeVEDS should help local printers add 3-D capabilities. And people should support local options for websites, graphics, videos, printing. Although it’s not exactly a tech issue, how about a downtown laundromat? For those of us with no cars or home laundry facilities, it’s nigh impossible to schlep laundry 2-3 miles by bus, and walking it up Putney Rd. is suicide.